Thinking about refreshing your bathroom? This year’s bathrooms definitely have a spring in their step. From bold bright blues to romantic rose tones, the latest bathroom suites, furniture and accessories come in a range of sumptuous colours. We’ve put together some fab ways to introduce colour to your bathroom design. If you’re looking for more inspiration, call into one of our stylish showrooms. Villeroy & Boch are renowned for their superior ceramics and sophisticated bathroom designs. 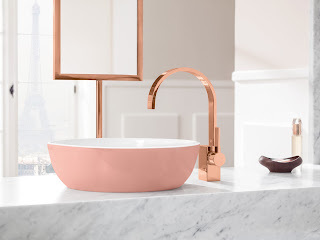 This spring they’ve teamed up with acclaimed German-Danish interior designer Gesa Hansen to create a collection of exquisitely coloured wash basins. Inspired by the seasonal changes in Paris, the designer has developed the Artis surface-mounted washbasin in a kaleidoscope of sweet new shades. There are 12 colours to choose from, including variations of green, yellow, rose and blue. The intense exterior colour of the basin is off set beautifully by a bright white interior. This pop of colour is ideal for bringing a family bathroom to life or creating a fresh focal point in a guest bathroom. Sweets for my sweet - bring colour to your bathroom with Villeroy & Boch’s Paris inspired wash basins. How about brightening up bath time with a vibrant coloured bath? 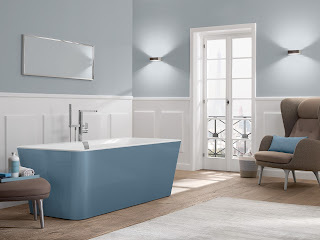 Villeroy & Boch’s La Belle, Squaro Edge 12 and Loop & Friends free-standing baths have been given the dual-colour treatment too. Designed to complement the designer’s coloured wash basins, the baths have a striking white inner surface and coloured bath panel. There are over 200 shades to choose from, so matching your bath to your wall colour, tiles or floor has never been easier. 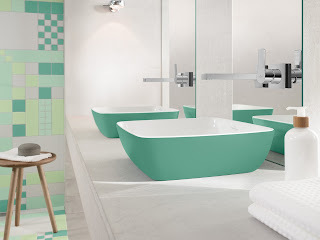 Coloured bathroom furniture is a great way to inject colour into your bathroom scheme. The Avento and Legato collections by Villeroy & Boch - which typically come in a spectrum of natural wood effects - have been extended to include sleek shades of black and blue. The acrylic glass front of the Avento wash basin cabinet can be customised in a variety of bold colours, including Crystal Black, Crystal Grey and Crystal Blue. 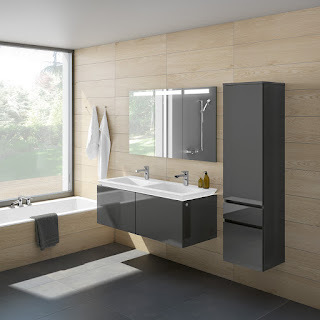 Whilst the Legato bathroom furniture is now available in intense shades of grey and black matt lacquer. Paired with snow white ceramics, the look is soothingly Scandinavian. Shades of Grey - for a relaxing Scandinavian feel bathroom pair Legato’s dark coloured furniture with crisp white ceramics. Why not create a splash of colour with your bathroom accessories? 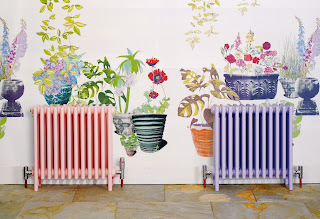 Bisque radiators come in a huge variety of exciting shapes and styles and can be fully colour customised too. 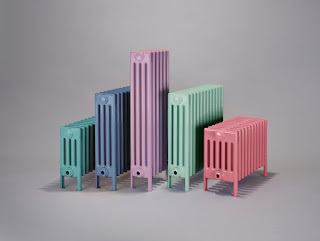 Their iconic Classic Radiator is available in over 2,000 colours and they’ve added five dusky pastel shades for Spring 2016: Mint Turquoise, Pigeon Blue, Pastel Turquoise, Pastel Violet and Antique Pink. Hot right now - Bisque radiators in pretty pastel shades look amazing in classic and contemporary bathrooms. You can browse the latest Villeroy & Boch colour collections, Bisque radiators and other luxury bathroom suites at our showrooms or for more bathroom ideas, take a peek at our Pinterest page.